How can you realign with your Authentic Self in Paris and thus move out of your depression? Why do so many people experience depression when they first move to Paris (or any other foreign country)? What were the results of my poll? How have people moved out of their depression and some other tools to help you realign with your Authentic Self in Paris and thus move out of your depression? 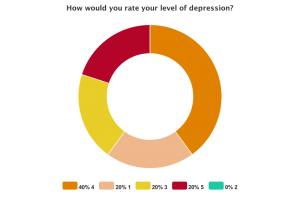 I have to admit that I am in agreement with the 80% (of people who completed this month’s poll) who said they were depressed when they first moved to Paris and the 20% who said their level of depression was at a level 5. The first day I started working in Paris, I was in the supermarket and I fainted. I remember feeling faint for hours before but fell straight into my belief system of ‘being strong’ and just carried on. I was at the counter paying, and the next thing I remember was people standing around me after I had lost consciousness. Are you thinking, “WOW! That seems a bit dramatic!” or “I totally get it!” It took me some time to try and understand exactly what was going on with me at the time and this is what I found. Let’s start at the very beginning. I hear it is a very good place to start. How does society create value? Often, society starts by first breaking down our initial belief we have in ourselves and then rebuilding it in accordance with what that particular society thinks is appropriate (this is the emergence of our ego). Innately however, as a human we want to do more then what is required to keep our value whole. What is the wholeness mean to you? To me it is the acknowledgement of your true beauty (your inner worth/ Authentic Self/ soul) that makes you feel whole. When these elements are not present it feels like your world has been shattered. When this happens, one of the defence mechanisms we step into is control. We want to control everything around us to prevent the pain we have felt from our world dissipating. Order and structure become important because of the physical, emotional and cultural change you have to endure around you. Change makes us feel pressure within about; being Ok, valuing ourselves as being enough and not feeling good enough. Change breaks us down. Our souls know that change is good for us but in reality we may not feel this and there is a conflict felt within the body. So we take this pressure into our experience. We then loose the essence of what it could be or that which it is. We may feel concern that we have accepted something that isn’t good for us but then we judge ourselves for thinking this. Can I relax into this way of life? Is it really me? Is it good enough for me? Or have I accepted it and it isn’t really? Keep in mind that these questions are in your unconscious, until they come into your awareness of course. We keep looking for things that “should be” more and more and more and when this is your question, what the universe does is show you everything that doesn’t make you feel whole. In truth, a lot is an illusion, it is not real. We have to go deeper, into the truth of what it means to be whole and not just the illusion of the mind (the conditioned beliefs that society has told us it means to be whole/ perfect). Do you believe that your soul chooses lessons to learn? Changing your external world is a choice our souls sometimes choose to learn the lesson that who we are is “good enough”. How do we learn this lesson on a soul level? It’s listening to, paying attention to and allowing rather than the pressure. An easy example to illustrate my point. Let’s say you are shattered (which you probably are if you are experiencing depression) and the French way of eating is to eat at 22h00. Firstly, acknowledge what does work for you in THIS MOMENT (not tomorrow or yesterday, but this EXACT MOMENT). What may work for you in this moment is to eat at 19h00 and maybe on the week end you can have a late meal. 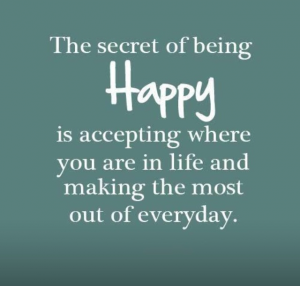 Secondly, adjust according to how you feel day by day. So that you are honouring rather than pushing. By pushing you are putting pressure on yourself – I have to have this, I have to feel like this, I shouldn’t feel like this. This is the external pressure, this is not real, this is the illusion of the mind has created. It’s what the judgement of the mind has decided that keeps telling you how to think, behave and do things. Bring in a different element – even if you decide – my main meal is going to be at 17h30. The different element is the awareness that this is “MY body”. You are acknowledging what is happening inside but still celebrating and honouring where you are. Thirdly, bring in the element of creative spark rather than the disciplinarian of all the things you have to do and achieve. You are still going to get there but how you get there, could be more relaxed. It is still going to happen but you get to choose how to experience it. Choose to experience it with more of the natural element. Imagine you are dancing! Your feet to walk/ gliding across the floor but what about the rest of your body? Look at every aspect of you so that you are whole. Don’t judge yourself from the mind that is telling your body how to think, behave and be but let it be from the other way around. Shifting it. I was born in Africa and as a consequence it will always be a part of my consciousness (my rhythm, my bas, my heart beat), a part of me and thus is an element that contributes to my experiencing my world as a whole. I have this in me and if I follow that part of me I don’t have to fit in and be how the French are, I just need to be my own rhythm. Who is that? What are all the elements of who you are? Are you the ‘presence’ of being pearls/ silk dresses/ colourful scarves? Who are you? How do you express your rhythm? When you feel comfortable with that, that is true beauty and that is what people see. Your shape fits into this expression and this is what vibrates – your rhythm. When you have got in touch with that rhythm you are not just telling yourself what it is going to be, you ARE IT. Feel the sense of experiencing all the different parts of you, feeling who they are? Is your true expression; African, Indian, American, Spanish? What is your authentic soul’s voice? What is calling out from within and how do you express this? When you are intimate, speaking, cooking or simply just being – this is what comes out. All the elements of the truth of who you are. Depression, I believe, is when you are depressing who you really are by fitting into a structure rather than thinking, “This is a structure and I’m living in it but I’m LIVING all the elements of who I am” within in it. What is the living part of you actually about? The structure shouldn’t change who you are. Yes we respect the ways and traditions of the country we are in but we are still who we are. Your spirit would die if you say you can’t be that. It needs to be that expression, where ever you are in the world. You NEED to express that part of your being. This is the true beauty. Lastly, is the understanding that you have the ability to do this today. What would a world look like where you constantly are in in a state of celebration of who you are? Ask yourself, “What is it for me that is working?” and then choosing to value that, allow that, live that, speak that. A beautiful affirmation you could use could be; “I’m surrendering into the new parts of me that are coming alive and I honour all those that I bring with me from my past”. What is the French element bringing out in you? Allow that, but remember that you bring with you every other aspect that you have every awoken to. All the different parts to you. How did you express yourself as a little child? Bring them out as an adult. You don’t have to control/ suppress that part of you, it’s a part of who you are. All of them are beautiful. As an adult you carry all these memories. The adult within you needs to feel that he/she can express this otherwise the result is depressed. When you feel alone, it’s because you mind is putting pressure on you by telling you how to think and behave. The pressure is you feeling like you have to speak French, you have to dress like the French, be like the French. In truth you don’t have to, it’s being in a far less critical way with yourself in these experiences. Doing it in a simple way, not a complicated way. Allow the sense of wholeness to carry you. You are learning, you are going as slow as the slowest part of you feels comfortable with and it is ok that you are in learning. You haven’t perfected that part. We experience so much pressure from the external world and it is this pressure that cause us to feel depressed and experience life in a dull way, where everything is being taken out rather than were life is being put in. Do things in simple contexts. Do something that is joyful. What inspires you? What makes your heart sing? Notice the small things! Look up at the beauty in the buildings, notice the colours and look at the detail in flowers. 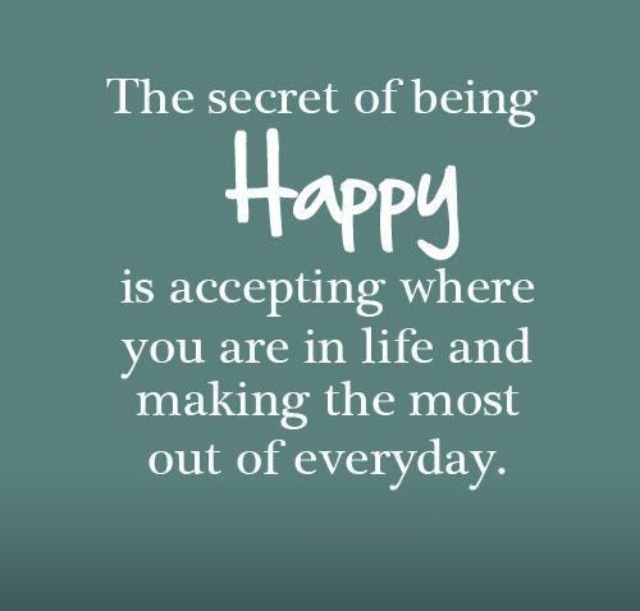 Keep a note book in your bag and write down every time you feel and/or see something that makes you feel happy? Healing is a gradual process, go with your natural flow. 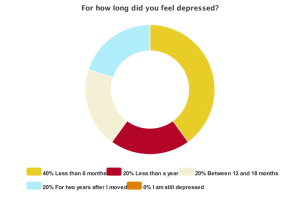 20% of the people who completed my poll said that it took them longer than TWO years to move out of their depression. Do you feel less alone now? Have you figure out why I fainted yet? I’m sure you guessed that it was because I ws allowing so much pressure from the outside in, rather than from the inside out. I now choose to, whenever I am aware, to listen to the rhythm of my true worth and in that heart beat I make decisions. Would you like to connect to the rhythm of your heart?